A couple of weeks ago I got home from work and noticed two packages on the doorstep. I thought ‘Sweet, my Belfort expansion is here. And something from Amazon.’ While the Amazon package was a birthday present for my dad that they sent to the wrong address, the second package was a real surprise. It was a preview copy of Mob Town. I had seen Phil of 5th Street tweet some pictures of the game and knew of it. But I didn’t expect to receive a copy. And I really didn’t know that I would like it so much. So there’s the spoiler. Here is a quick synopsis. 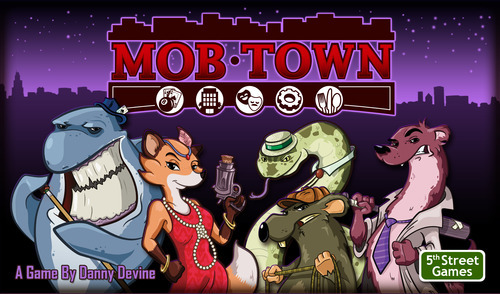 Mob Town was designed by Danny Devine and is to be published by 5th Street Games. In Mob Town, you play a mob boss trying to gain control of a town. You use your ‘buttons’ or minions to take over businesses in the town based on some hidden agendas that you have selected. Points are scored based on the popularity or importance number of the property. You play over three rounds. The Boss of bosses is the player with the most points at the end. Now for the details. As I mentioned Mob Town is a card game about taking over towns. So at its core an area control/majority game. You want to take over as many businesses as possible to score the most points. But you also want to fulfill your two agendas to get extra points. Oh, and there are those other bosses. They’re trying to take over the same businesses. And they can take your businesses right out from under you. You have to fight for your territory. How do you take over businesses and fight to get them back? By using your minions. 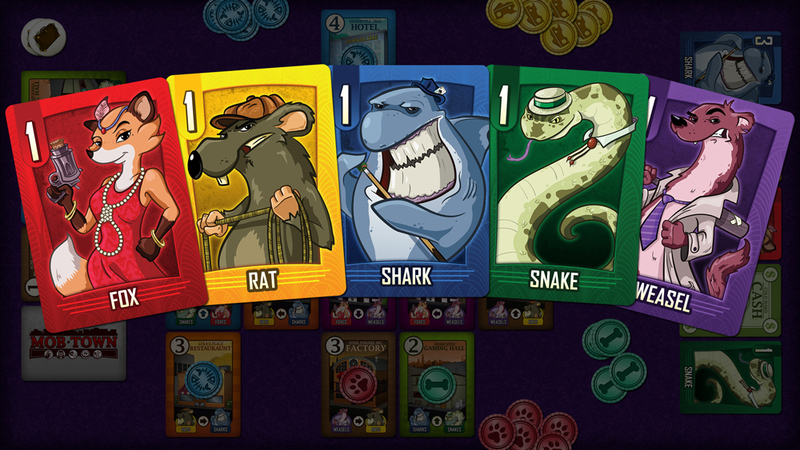 Each minion card shows a picture of one of the kinds of minions – snakes, foxes, sharks, weasels, and rats. Minion cards also have a number, one, two, or three telling how many of that type of minion the card represents. So a shark card with a two on it would mean its value is two sharks. You use combinations of minion cards to take over the businesses. Let me talk about the businesses first. There are five types of businesses – restaurants, theaters, hotels, game rooms, and factories. Each business card has a value on it. This is the number of minions needed to take control of that business. As I mentioned above, the icons tell which type of minion must be used to take over that business. One last thing on the card is an arrow. This arrow is the heart of Mob Town’s unique town creation mechanic. I’ll get to this in a moment. Each player starts out with three randomly dealt minion cards. Five more are dealt out to the side of the town to form the Line-up and the rest form a draw deck. The Line-up cards are available for trade during the game. Oh, I forgot one card type, Cash. These cards can be traded in for any three of the Line-up or they can be used as a wild. It can stand in for any one minion. 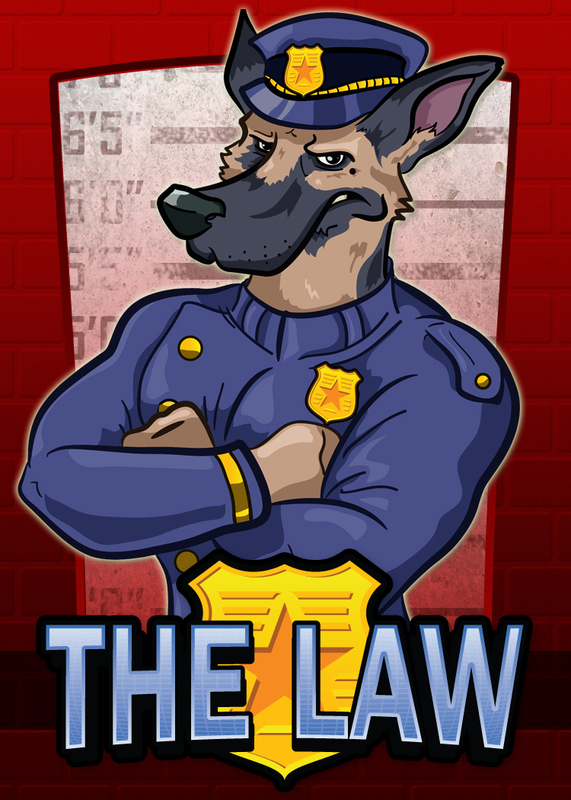 There is one last card in this deck – The Law. The Law card is shuffled into last ten cards of the minion draw deck. When The Law shows up the round is over. Building the town is a simple matter of laying out the business cards. The cool, interesting part of this is how you lay out the cards. As I said, each business card has an arrow on it. The arrows point in one of four directions – left, right, up, down. You lay down the first card. The arrow tells you where to lay the next card. The arrow on that card tells where to place the next and so on. Once you have your town laid out, you place three businesses to the side. These are called the Open Lot area. These are available during the game. The next card type I’ll talk about are the agendas. The agendas are goals for you to obtain each round. They are bonus points describing some condition related to the properties you control at the end of the round. Examples are ‘Most Connected Properties’, ‘You control the most hotels.’. You choose two of the agendas for the round. If you complete these at the end of the round, you earn 3 points for each completed. Each player gets a number of claim tokens in their player color. These are used to mark businesses that you have taken over. There is one more important type of component. This is the briefcase full of money token. These are used to purchase businesses from the Open Lot area. These businesses can then be placed anywhere along the edge of the town. Lastly the game comes with a score track, some scoring markers, player tokens, and four player assist cards. Let’s talk about how the game is played. After you shuffle the property cards, you place the indicated number, based on the number of players, out to form the town, following the arrows mechanic described above. Next you place the Open Lot cards. You shuffle the minions deck, deal out three cards to each player. Then you lay out five of these for The Line-up. Shuffle The Law into the last ten cards of this deck and place the deck to the side of The Line-up. – Draw two cards from the draw deck. – Switch Agendas – You can switch one agenda for another. – Open Lot – You can spend one briefcase to take one of the Open Lot businesses and place it. You may then take it over if you have the appropriate minions to do so. – Take Over – To take over a business, you discard the number of cards matching the two suits on the property card in any combination equal to the value on the property card. If you do so, you place one of your claim tokens on the property card. If you want to take over a business/property that another player has already claimed, you have to pay one extra card for each token on the card. If you do so, place one of your tokens on the top of the stack on the card. As the game progresses you’ll want to take over another property. This property must be orthogonally adjacent to one you control. If not you must discard a card for every property you have to ‘pass through’ to get to it from one of your properties. This is the connection cost. If those cards happen to be controlled by another player you pay that connection cost to them. Play continues with each player taking one action per turn until…The Law shows up. When a player draws The Law, the round ends and scoring happens. You score the face value of the properties you control plus 2 points for each unused briefcase plus any agendas you reached. You then shuffle all the cards with their respective types and rebuild the town, Open Lot, The Line-up, and the draw deck with The Law in place. You play through another two rounds and then score a final time. The player with the most points is the Capo. adds difficulty and strategy as the arrangement of the town itself plays into a player’s decisions. A town with a single card connecting two town nodes offers a tempting control point. But if it is only a value one then it may not be worth the trouble. The take-over mechanic is easy to understand and adds some ‘take that’ to spice the game up. The resulting player interaction can be very entertaining. The briefcases give additional options for scoring and afford last minute surges. The Cash cards enable players to profit for the changes that occur during the game. The physical parts of the game are excellent. First, the art is fun and fantastic. The cool thing and slightly unusual thing is the artist is also the game’s designer. Yup, Danny did the art too. That’s his regular day job, artist. The animal are nice and cartoony and will appeal to a wide audience. 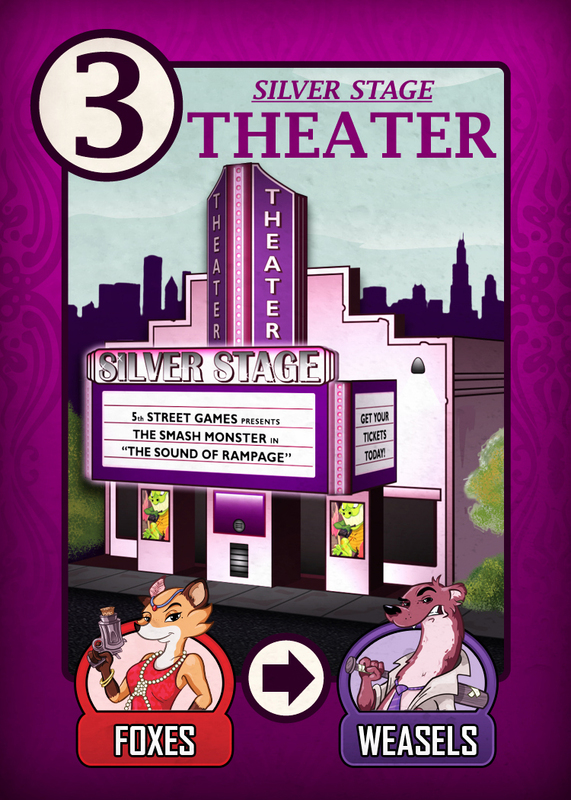 Danny’s infused some humor into the game too by naming the building with insider references and fun names like The Motel Hotel Inn and one theater showing a 5th Street Games Film starring The Smashing Monster in’ The Sound of Rampage; and Coming Soon: Ghosts Love Candy. I appreciate adding fun to a game. There’s some fun things in the minion cards too like the weasel with the baseball bat and the shark with the pool cue. Nice references Danny. The theme of the game comes through very well. Taking over towns, fighting over properties, and running to another town when The Law shows up. That’s how I would imagine mob life to be. So the game’s not just about some cool mechanics. Bravo Danny. The game is currently halfway through its Kickstarter campaign and only about $800 away from funding. The base game pledge level is only $25. For $35 you get the base game plus the City Limits expansion. I’ve play PnP’s of two of the three expansions included in City Limits, Professionals and Cities. These expansions add special player powers and other game variations. I really enjoyed both these expansions and think they are well worth the extra $10. There are a few other pledge levels. One will get you an early Game Crafter produced copy of the game while your regular production copy is made. One will get you personalize tokens. And there are two levels for multiple copies of the game. I’ve played Mob Town with my kids and with some of my gamer friends. It’s a hit with both. Mob Town is a solid, well designed casual game that will please most anyone. I recommend it. You can support Mob Town right here. Go do it now. Once you’ve done that go over to the 5th Street Games site and check out all their cool games. I would like to thank Phil for providing a review copy of the game.